Cavities, dental crowns and/or have sore and bleeding gums, result from a change in the mix of bacteria in the dental plaque on the tooth surface. A healthy mouth has a balance of bacteria. When poor oral health occurs, the diversity of bacteria narrows with some bacteria becoming dominant. This shift is called oral dysbiosis. Oral dysbiosis is largely influenced by age and other chronic medical conditions. It commonly happens past mid-life and coincides with diabetes, suppression of immunity, arthritis, Parkinson’s Disease, COPD, cancer therapy and multiple medication use. Other factors are an inability to maintain good oral hygiene and a change in diet. There are a number of controlled studies that show the benefits of correcting oral dysbiosis. Illustration: Adapted from Herrero ER et al.2016. Dysbiosis by neutralizing commensal mediated inhibition of pathobionts. Sci Rep. 6 with assistance of Dr. Howard Tenenbaum. 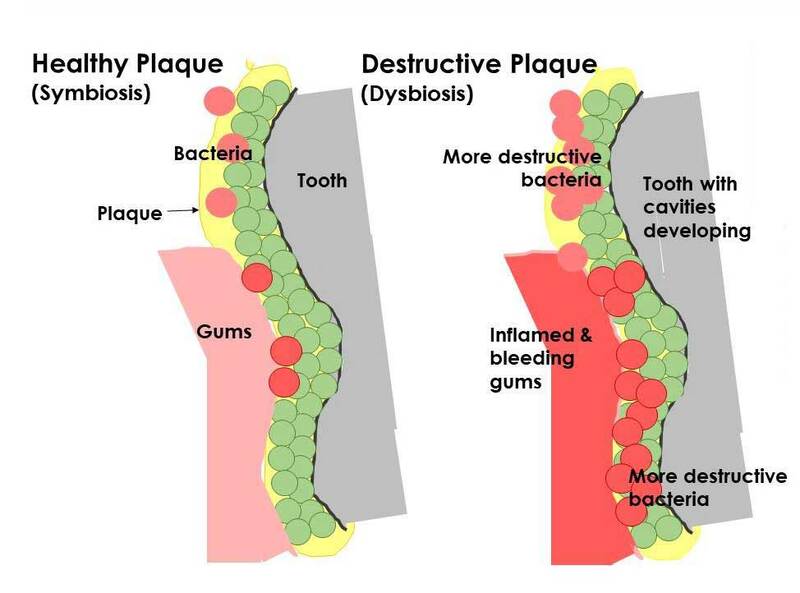 The mix and virulence of bacteria in the plaque changes. This change causes (a) an immune response to damage gum tissue, and (b) more acids causing cavities.